Cafe doors, also known as saloon doors, are easily installed. They lend a breezy, casual look to a doorway. Most cafe doors are installed 18 inches to 24 inches from the floor to the bottoms of the doors, but you can install them at any height you desire. Cafe doors are lightweight with pivots sitting on special hinges; the hinges allows the doors to open and close in both directions. The pivots are designed to return the open doors to the center of the door frame by gravity. Installing cafe doors is a simple process, and should take an hour or two. Add a casual or rustic look with cafe doors. 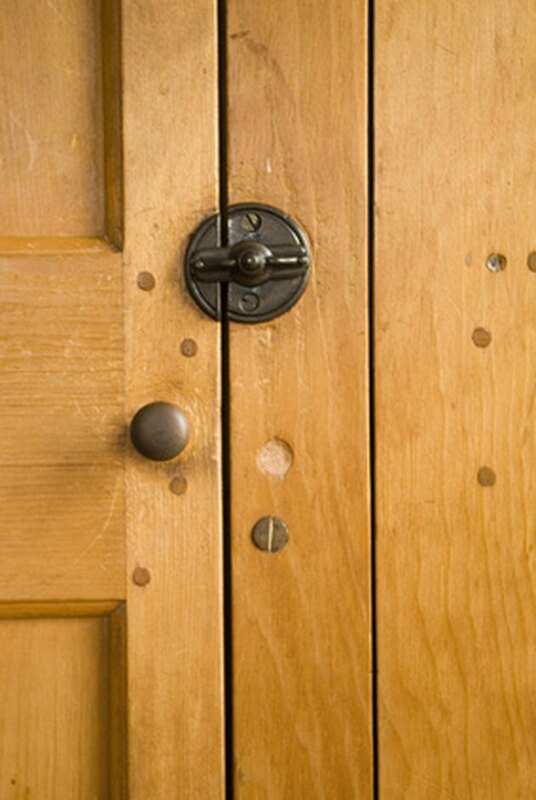 Prime the cafe doors if you are painting them; stain the doors if you are staining them. Allow to dry. Sand the doors lightly if the grain feels rough. Apply two coats of paint or two coats of polyurethane sealer. Allow each coat to dry completely before applying an additional coat. Install the pivot hardware on the tops of the cafe doors, allowing 7/16 inch between the finished back edge of the door and the pivot. Install the pivot hardware on the bottoms of the cafe doors, allowing 5/16 inch between the finished back edge of the door and the pivot. Make sure you mount the top pivot hardware to the tops of the doors, and the bottom pivot hardware to the bottoms of the doors. Measure 24 inches (or your preferred height) from the bottom of the floor to the bottoms of the doors, using the measuring tape. Mark the height on both sides of the door jambs with a pencil. Screw in the bottom hinges at your pencil lines on both jambs, using the Phillips screwdriver. Set one of the doors into the bottom pivot hinge. Take the top pivot hinge, insert it into the top pivot on the door, and position the placement of the hinge on the jamb. Use the level on the side of the door to ensure that the door is level on the jamb. Allow a clearance of 3/8 inch between the pivot hinge and the top pivot on the door. Screw the pivot hinge into the door jamb while holding the door level in it place. Repeat this step for the other door.